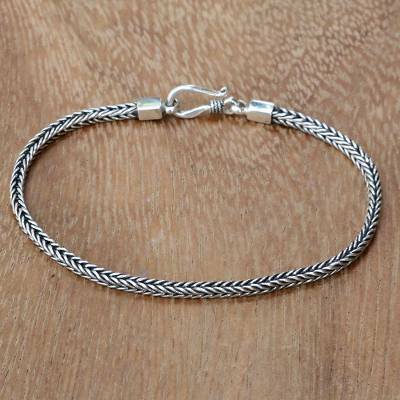 Hand Crafted Sterling Silver Chain Bracelet from Bali, "Dragon's Tail"
Classic with a modern flair, this sterling silver bracelet featuring a foxtail chain and hook clasp is presented by Wayan Asmana of Bali. The artisan calls his design naga, which means "dragon" or "snake" in the Balinese language. Celuk is a Balinese silversmithing center and it is there that Asmana, while still in elementary school, began to learn the art of jewelry making. His father was a well-known silversmith who taught him bon, jawan and other jewelry techniques that have been handed from generation to generation in Celuk. Now in his sixties, Asmana has taught this art to many others and is dedicated to seeing it passed to the next generation. Wayan Asmana has received 3 microcredit loans with 0% interest from Kiva and Novica, the first for $2850 and the most recent for $3000. Asmana and his workers rely on the stable income that Novica sales bring. These sales are their primary source of income. Asmana employs assistants and silversmiths. It's beautiful - and a wonderful note enclosed from the artist is a nice touch. Thank you for my Birthday gift !! I love this bracelet so much that I never want to take it off. It is even prettier in real life than on the photo. I love the little gift box and note from the artisan. Will order again from this talented craftsman. "Sadly it fell off on first wear so check the clasp"
I loved this. Also very delicate and feminine and sat beautifully on my arm. It was very nicely made but I did not check the clasp properly and was very sad to find I had lost it on my first outing with it. I did retrace my steps but I did not find it. Very sad so check the clasp. I would still recommend it and buy it again (If I had the money!) but would just tighten the clasp a bit. This is a simple but beautiful bracelet. It is sturdy, but not heavy on the wrist. Bought this as a gift for my wife, it matches the one that she gave me years ago. They are both beautiful pieces of jewelry. this is a gift for my daughter. she loves it and says she will never take it off! "Something I can wear everyday." I love this bracelet. So far everything I have purchased, I have loved. What I really like about all of the pieces is that they are different. Every time a wear my bracelet someone has to a make a positive comment. Purchased this about a year ago, and my husband has hardly taken it off at all. He loves it, it's easy on & off, and it doesn't snag on anything. Very pleased with the worksmanship! This is a beautiful piece of exceptional quality. It will soon be one of my favorite pieces to wear. Thank you! Just received my bracelet. Love the intricate craftsmanship. A little smaller than it looked in the picture, but I love it nonetheless. "My jewelry is now known in many different countries... thanks to you. I will continue to work harder and better to please you, all my dear customers. Thank you so much!" "I am thankful that God gave me a chance to join with Novica. My jewelry is now known in many different countries, and my family and I feel so much this uplift in our economic life thanks to you. We hope this can last forever, and I will continue to work harder and better to please you, all my dear customers. Thank you so much!" Wayan Asmana is a master silversmith from Sukawati, long regarded as Bali's most important jewelry center. Asmana learned his craft when he was in elementary school but only when he was in senior school did his father teach him how to make gold accessories. Wayan Asmana senior is unquestionably a renowned jewelry maker and designer. When Asmana returned to his village after going away to college, he married his beautiful bride, Wayan Asmariani. Then he set about starting his own jewelry workshop where he designed and crafted a variety of gold and silver accessories. Business began to flourish and tourists were his main customers. Unfortunately, events such as the World Trade Center attacks and the Legian-Kuta bombing have had a very bad impact on Bali's tourism trade, which in turn has affected Asmana's work. Setting up on his own is difficult. Asmana tells of the time, three years ago, when a foreign tourist bought almost $1,200 worth of products. When Asmana went to the bank to change the dollars into into rupiah, he was told the money was counterfeit. There was nothing Asmana could do about it. Such a pretty ring... nice detail!